We are currently in the process of developing the Surf Safe Instructor Training program, which aims to increase awareness and injury prevention of Surfer’s Myelopathy among first-time surfers through a novel intervention for surfing instructors. 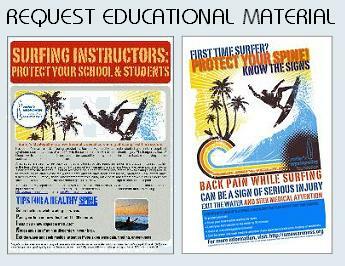 Educational programs are being established that will increase knowledge, awareness, and early detection of SM cases in first time surfers in surfing schools. Since prolonged time spent in the water exacerbates the symptoms and increases the severity of the paralysis, early detection by surfing instructors of this severely devastating syndrome is of paramount importance in order to prevent further injury. Participating surfing schools will receive an accreditation from SMF that will help ensure proper detection and referral of SM cases in first-time surfers.